Geraldine (Gerry) Largay, aged 68, was a retired air force nurse who had hiked long trails near her home in Tennessee. Like many other avid hikers, she decided to tackle the Appalachian Trail in Maine on a thru hike during the summer of 2013 over the course of six months. Initially, she hiked with a friend called Jane Lee but later continued alone. On July 23, 2013 she became lost after leaving the trail to relieve herself and was apparently unable to find her way back. Like Jessie Hoover who vanished in 1983, she was in the area of the 100 mile wilderness, a rugged, difficult to hike area where it is easy to get lost. She was last seen by fellow hikers on July 22nd at the Poplar Ridge lean-to. Gerry had been walking the length of the famous 2,200 miles (3,500 km) long Appalachian Trail from Springer Mountain in Georgia and Mount Katahdin in Maine. She had been in constant contact with her husband George until she became lost for small reunions and resupplies. George was not far away on the morning she went missing as he had driven to the Route 27 Crossing, about a 22-mile hike away from the shelter where his wife was last seen. At this point she had already walked more than 1,000 miles. Her trail name was “Inchworm”. She tried to text her husband after she became lost. At about 11am she wrote: “In somm trouble. Got off trail to go to br. Now lost. Can u call AMC to c if a trail maintainer can help me. Somewhere north of woods road. XOX.” Unfortunately, the text was never sent because of poor cell service in the area. Geraldine tried to find higher ground and attempted to send the text 10 more times in the next hour and a half. She eventually decided to camp for the night. The next day she tried to text again, with an undelivered message at 4.18pm: “Lost since yesterday. Off trail 3 or 4 miles. Call police for what to do pls. XOX.” She appears to have lost her GPS tracker which she purchased, leaving it in a hotel room or lean-to. The following day, George became very concerned and the official search effort started by the warden service including search aircraft, state police, national park rangers and fire departments. Bad weather hit the area at the time with heavy rain which didn't help tracking efforts. They searched side trails, interviewed hikers and used canine teams. But there was no sign of Geraldine. The wilderness had swallowed her up. Her initial trail companion, Jane Lee, who had hiked much of the trail with Largay before a personal emergency called her away, told wardens that her friend found navigation difficult with a map and compass and sometimes struggled to keep up. In October 2015, Geraldine's body was eventually found near the Redington Township, close to the Redington Stream, and it became apparent she had survived nearly a month in the wilderness before succumbing to the elements and lack of food. She waited in vain for a rescue team that never came. However, at least three K9 teams came to about 100 yards of the camp but failed to detect her. The discovery of her camp was caught on camera by a crew filming Animal Planet reality series North Woods Law, The body was found on a land owned by the U.S. Navy in Redington, three miles away from where she was last seen. The Navy uses the area for its Survival, Evasion, Resistance and Escape program and it is inaccessible and very remote. What was amazing was that the remains were so close to civilization. Walking south from the campsite, the dense forest became open woods with good visibility after 60-70 yards, and after another 25 minutes there was a clear logging road that led to lodging. When wardens arrived at the scene they saw a flattened tent, with a green backpack outside of it and a human skull with a sleeping bag around it. The campsite was difficult to see unless you were right next to it as it was in dense woodland and as the tent was under several large trees whose branches obstructed the sky. Gerry had built a bedding area out of small trees and pine needles to keep her tent out of any water, and had tied a space blanket between branches to provide some cover. Largay had also tried to set fires as nearby trees had been charred black. In the camp, they found maps, a rain jacket, a space blanket, string, Ziploc bags, a flashlight that still worked, a blue baseball cap, dental floss, a homemade necklace with a white stone wrapped in string. A journal found alongside her body reveals she survived until at least August 18th. It was titled “George Please Read XOXO”. In it, Gerry explained that she had spent about two days wandering after a wrong turn across a stream and that she had tried to find ridges where she could find her bearings. The Journal also contained a final request, dated August 6:"When you find my body, please call my husband George and my daughter Kerry. It will be the greatest kindness for them to know that I am dead and where you found me - no matter how many years from now. Please find it in your heart to mail the contents of this bag to one of them." 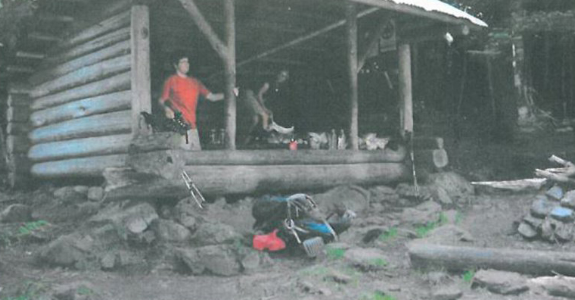 Wardens believe Largay went to higher ground in an attempt to get a better cellular signal before making camp on a raised knoll. After a month at camp, she finally died from lack of food and exposure. Because her remains were inside the tent it seems the sniffer dogs and cadaver dogs were unable to pick up on her scent despite being so close to her camp on several occasions. But since searchers in such proximity to Gerry's camp, it was a mystery that she failed to hear their activity and call for help. Perhaps by then she was too exhausted caused by hunger. Why Geraldine failed to find the nearby logging road and was undetected by the many search teams is a little strange. The area in which she was located was a U.S. navy training facility and this adds to the mystery. Why did Gerry get so lost so quickly The Appalachian Trail Conservancy, tasked with maintaining the trails, reroutes several paths every year after flooding events or as part of ecological restoration projects. When they cut a new path there will be a junction where you are on the new trail instead of the old. They try to block it off with tree limbs, and remove the old blazing by scratching it off the trees but sometimes old blazes are still there but faded which can cause confusion. A very sad story indeed and one that underscores the dangers of solo hiking on the Appalachian Trail and the 100 mile wilderness area around Maine.